Enjoy Capri all to yourself! To be perfectly honest, November is not the best month to visit Capri and the Amalfi Coast: the weather is often unpleasant, many hotels and restaurants are closed, and the days are short. So, is Capri worth a visit in November or not? Yes, it is! You will experience a pretty rare privilege: having the island all to yourself, so you will grasp the real essence of the island without crowds of tourists! In truth, even in November there are beautiful sunny days that have the added advantage of no crowds: so, plan safely your holidays here in advance or keep your eye on the weather to take a last-minute trip. You can take a boat tour around the island or just relax on the beach under the autumn sun and get your fill of vitamin D... at least on your bare arms and feet! Indeed, when those rare warm autumn days pop up, islanders immediately head to the beaches with southern exposure like Marina Piccola in Capri, and some even take their final dip of the year! Blue Grotto is seldom open due to the weather, but you can definitely visit the most famous sites of interest by walk or just strolling around down the streets to breath the authentic atmosphere of the island. If you are planning to stay in Capri in November, check openings of hotels and restaurants on the island before booking: there are a few open, but very good ones! Boat tour + 4 free hours to visit Capri by land: see the best of Capri with a 7-hour tour departing from Positano! 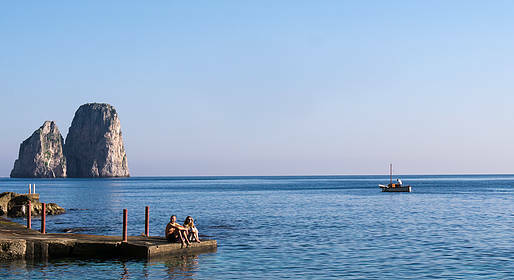 Sail past the Faraglioni and Blue Grotto, stopping to swim. Boat with wc. Towels, snorkeling masks, aperitivo on board. Private full day tour or shore excursion of the most beautiful gems along the Amalfi Coast. Hop aboard our elegant sedan or minivan to visit Positano, Amalfi, Ravello, and the prettiest fishing villages along the coastline! Bilingual driver will assist you during your tour.